SDE offers a selection of numerical modelling and simulation services to support development of mission-critical systems for our Defence customers. The company’s considerable expertise in the field of Weapons, Ordnance, Munitions and Explosives, coupled with use of a high-end suite of commercial and bespoke software tools, ensures that we understand the ‘problem-space’. This allows us to identify potential pitfalls and tailor our analyses, adding value by producing results which are, not only timely, but reliable and robust. 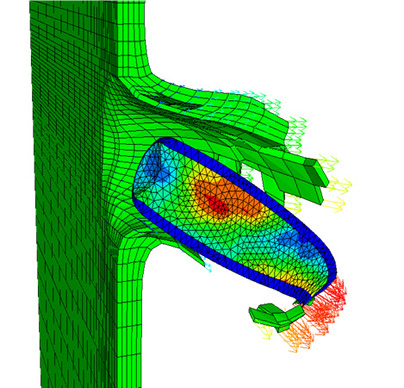 Hydrocode is a numerical modelling tool for simulating the behaviour of solid, fluid and gaseous mediums by considering the effect of both internal and external forces on a pre-defined mesh of elements. Based around Newtonian laws of motion; the equation of state; and the constitutive model; it offers a powerful way to study time-dependent, highly non-linear problems where the scale or extremity of conditions are beyond the range of laboratory or field experiments. SDE have developed a considerable portfolio of expertise in the application of hydrocode modelling techniques for analysis of ultra-high-speed events. 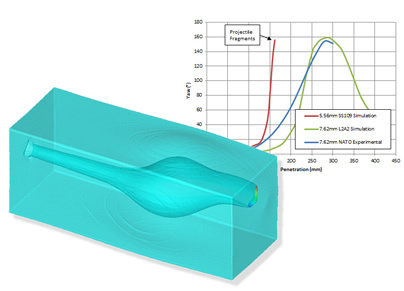 Using ANSYS Autodyn, engineers at SDE can simulate a variety of highly-complex physical phenomenon, including projectile penetration, blast wave formation & structural interactions, and sympathetic reaction of energetic materials. A blast wave is created when energy from a detonating explosive charge is transferred to the surrounding air medium. Close-in the impulse from a blast wave can exert significant mechanical work on nearby objects inflicting damage to structures and injuries to personnel – particularly in enclosed environments. SDE are able to undertake high fidelity analyses to provide critical insight into the complex interaction of blast overpressures with structures, such as buildings, vehicles and stowed munitions, in either enclosed or open environments. Results can enable quantification of expected damage levels and also allow assessment and optimisation of protective mitigation structures. SDE have recently completed a programme of detailed blast modelling for a large UK defence prime contractor to investigate explosive effects within the naval weapons magazines. The impact of a high-velocity projectile is a complex non-linear event, involving strain rates of the order 104-105s-1, which can present significant challenges to implicit finite element solvers. Using explicit hydrocode modelling, SDE can simulate the terminal performance of both kinetic energy fragments/projectiles and chemical energy warheads. Making use of a comprehensive database of common structural and armour materials, detailed modelling of the penetration mechanics can be undertaken including phenomenon such as hydrodynamic penetration and target failure modes such as plugging, petalling, scabbing, spalling, etc. The results of such analyses can offer insight into the performance of ammunition or protection systems, and the process can be used iteratively to optimise the design in a virtual environment, thus avoiding the significant costs associated with live fire testing. 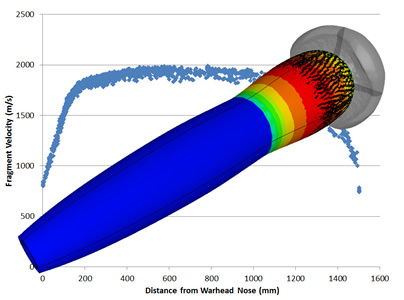 SDE have employed soft and hard target bullet terminal performance hydrocode modelling in the concept design phases of enhanced lethality small arms projectile development programmes. Initiation of a munition during transportation and storage may present a significant risk to nearby personnel, the facility or the platform. Appropriate packaging can often be designed to mitigate the effects of an initiation and reduce the likelihood of sympathetic reaction of other stores in close proximity. 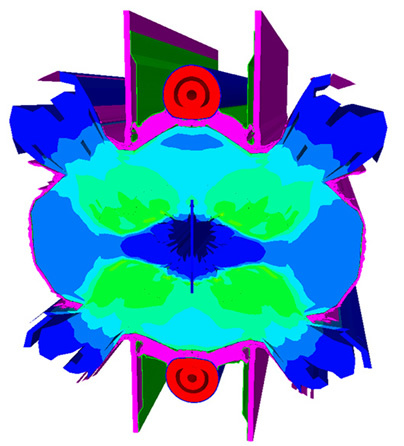 SDE can employ hydrocode modelling to simulate the detonation of a donor weapon system and examine the blast/fragmentation effects on nearby acceptor munitions in order to predict whether communication would be expected to occur. This approach can be extended to assess and optimise the performance of mitigation and packaging materials and also to generate robust evidence to form the basis for Quantitative Risk Assessment. SDE have made use of hydrocode simulation to assist in the design process for magazines on board a number of Royal Navy platforms. Projects undertaken include intra and inter stack mitigation optimisation studies for munitions including torpedoes, depth charges and missiles. In the design of a fragmenting warhead, the optimum fragmentation pattern is dictated by the nature and level of protection of the primary target set. For example, a warhead producing a large number of small fragments may be highly effective against a light skinned reconnaissance vehicle but thoroughly ineffective against an armoured personnel carrier. Further, current moral and legal issues drive research and development into ‘Low Collateral Damage’ fragmenting warheads. 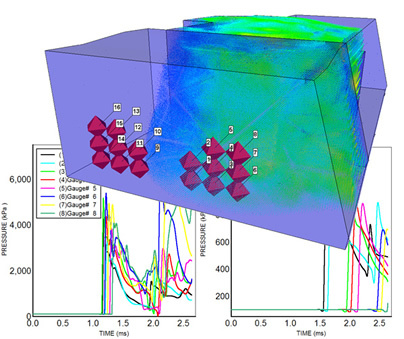 Using advanced hydrocode modelling techniques and calibrated stochastic failure material models, SDE can predict the characteristics of the fragmentation pattern and investigate the effect of various warhead design features on the mass, velocity and direction of the fragments produced. SDE are providing support to number of weapon system OEM’s to assist in the development of advanced fragmenting devices and munitions. The use of chemical energy warheads incorporating Shaped Charge Jets (SCJ) and Explosively Formed Projectiles (EFP) is common place in military weapon systems. SCJs and EFPs are formed when a lined hollow charge is detonated and the liner material is extruded forward as a super-plastic jet or high velocity slug. SCJs are capable of penetrating significant thicknesses of armour at short standoffs whereas EFPs offer reduced penetration performance but remain effective out to much greater ranges. However, the performance of both SCJ and EFP warheads is highly dependent on a number of key design parameters including standoff distance, cone diameter, liner thickness and apex angle. SDE can make use of hydrocode modelling techniques to aid the development of both SCJ and EFP warheads. 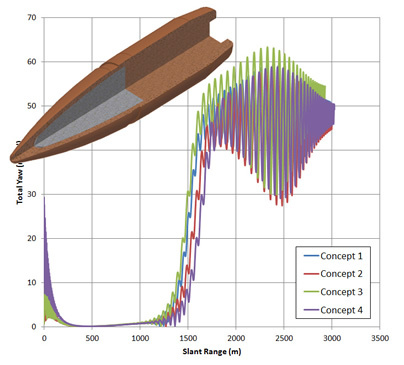 A variety of design iterations can be quickly modelled and performance of the impacting jet/slug studied, in order to optimise the configuration of the warhead against a given target set. Ballistics is the study of the motion of a body with momentum which is free to move under the actions of inertial and aerodynamic forces. An understanding of the underlying science behind internal, intermediate and external ballistics is fundamental in the design of ammunition and critical to ensuring accurate and consistent delivery of a projectile to the target. SDE has been a key player in the field of military ballistics, both in the UK and overseas, for over two decades and has developed significant experience in application of unique range of commercial and bespoke ballistic analysis software tools. The ability to fully simulate both the in-barrel and flight characteristics of a projectile enables a wide range of analyses to be undertaken including projectile design, performance assessment and optimisation; reduction of radar trials data and generation of firing tables; and calculation of Dry Zeroing charts. The development of military ammunition often requires a trade-off between the various design parameters in order to achieve the optimum configuration. For example, in small arms ammunition design it is desirable to ensure good dynamic stability, to reduce in-flight drag, and achieve maximum hard target penetration. On the other hand, enhanced terminal effect in soft targets is often achieved by promoting projectile instability, causing it to yaw and therefore impart maximum kinetic energy. 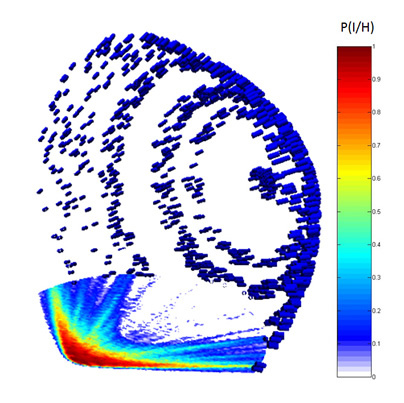 Using industry standard ballistic analysis software, SDE can perform a full range of internal, intermediate and external ballistics analysis to support the design and development of spin and fin-stabilised ammunition. 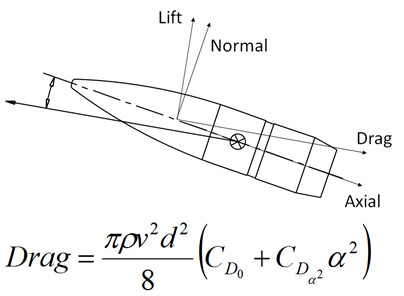 Internal ballistics calculations can be conducted to investigate the in-bore characteristics of the projectile including optimisation of propellant loadings to achieve target muzzle velocities. Intermediate ballistics calculations can be performed to examine the muzzle exit characteristics of the projectile and estimate aerodynamic jump and yaw. Stability analyses can be undertaken to analyse and fine-tune projectile in-flight dynamic stability and 4 or 6 degree-of–freedom external ballistic trajectory calculations performed to establish flight performance including prediction of maximum range. This capability has been used the basis for a large number of ammunition concept design and evaluation studies programmes including development of enhanced performance and reduced range projectiles. In addition, SDE has developed a bespoke software tool ‘CCOM6’, based around a 6 Degree of Freedom trajectory code, capable of incorporating the effects of projectile mass asymmetry to enable estimation of the induced ballistic errors. Mass asymmetries within a projectile can occur for a number of reasons including manufacturing tolerances (i.e. variation in wall thickness of a large calibre artillery shell casing), inconsistencies within the warhead fill, or incorporation of a mechanical Safe and Arm Unit (SAU) within the fuze. In a gyroscopically stabilised projectile eccentricity will result in significant vibration and, importantly, can also lead to deviation in the ballistic trajectory and reduction of the probability of hit. SDE’s CCOM6 trajectory code has been used across a wide range of calibres to assist in ammunition development and design down-selection. Ammunition firing tables, ballistic tables, or range tables as they are sometimes referred, provide key information to the firer or computerised Fire Control System to allow aiming of the weapon system based on target range and a number of other ballistic considerations. Availability of an accurate firing table is therefore critical in increasing probability of hit on the target, weapon system effectiveness and reducing ammunition expenditure. The Firing Table creation process begins with determination of aerodynamic coefficients for the projectile. Whilst indicative firing tables can be produced based on predicted coefficients, generation of precision tables suitable for use in theatre requires analysis of test data obtained from radar instrumented firings. Using specialist analysis software SDE can combine radar data from multiple firing serials, accounting for variation in meteorological conditions, and derive baseline Mach-Drag data suitable for subsequent use in generation of firing tables. SDE operate industry standard external ballistics software which enables generation of Ground-to-Ground, Ground-to-Air or Air-to-Ground firing tables. Based around a 4DoF Modified Point Mass Model (MPMM) and a projectile external ballistic model incorporating predicted or derived aerodynamic coefficients, the software can create firing tables in a variety of standard or bespoke output formats. Firing tables can also be configured to include aiming correction for a series of non-standard conditions (e.g. crosswind, muzzle velocity variation, changes in atmospheric pressure). The company have been supporting ammunition Range and Accuracy trials for almost 30 years and have conducted analysis of radar data and generation of firing tables across the full spectrum of calibres for development and in-service projectiles including 30mm FMPDS, 40mm HEDP grenades and the entire family of Nammo 12.7mm ammunition. Dry zeroing charts can be used to allow zeroing of a weapon system for a particular range without the requirement for live firing. Generation of the charts is based on analysis of a number of geometrical factors, including offset of the sighting system from the barrel axis, range to the target, and knowledge of the ballistic trajectory of the ammunition being fired. SDE has developed extensive experience in creation of Dry Zeroing Charts for a range of commercial and government organisations across a wide range of weapon systems including 5.56mm SA80-A2, 7.62mm GPMG and Minigun. SDE has developed a bespoke software package, ‘ASPECT’, capable of undertaking survivability, vulnerability and lethality modelling to generate quantitative Measures of Performance (MoPs) and low-level Measures of Effectiveness (MoEs). Ammunition, Weapon and Soldier or Weapon System lethality can be assessed against different targets, including personnel, vehicles, aircraft and naval platforms; whilst the survivability or vulnerability of these targets can be assessed against a wide range of threats. ASPECT can undertake trade-studies to form the basis of cost effective optimisation for both munitions and protection systems. Data such as probability of kill/incapacitation, time of suppression, number of rounds required to incapacitate, can be produced. This can be used to provide inputs for higher level Operational Analysis (OA) models and also enable platform, weapon and munition system level requirements to be derived from capability based requirements. 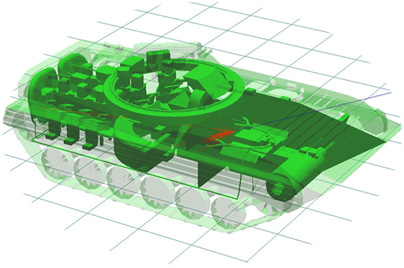 SDE’s ASPECT software has been used extensively throughout a number of major UK and overseas soldier research and modernisation projects as an essential tool for the assessment and optimisation of soldier, weapon, ammunition, vehicle and armour system performance and effectiveness. ASPECT has 3 main modules which enable a wide range of analyses to be conducted, these are the Error Budget module, Terminal Effectiveness module and System Performance module. A Soldier or Weapon System Error Budget comprises of large number of errors, including soldier, vehicle, weapon mount, weapon, ammunition and meteorological errors, which combine to produce a resultant deviation of the projectile impact from the point of aim. These errors reduce the probability of hit on the target and are therefore detrimental to the overall effectiveness of the system. Using ASPECT’s Error Budget module, the effect of all factors which contribute to the system error budget can be assessed individually or in combination. Based on either measured or empirically derived error inputs, the software can undertake Monte Carlo analyses, using the trajectory modelling algorithms, to determine the probabilistic distribution of impact points on the target and therefore the probability of hit. This enables key contributing errors within the System Error Budget to be identified, allowing engineering and development efforts to be focused in the critical areas. Whilst the ASPECT Error Budget module has been used on a standalone basis to support a number of major defence research and development programmes, the module also provides the foundation for the wider System Effectiveness capability within ASPECT. 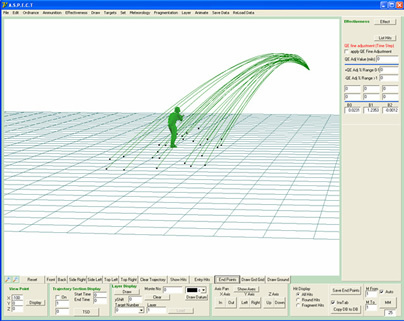 SDE’s ASPECT software incorporates a series of terminal ballistics algorithms capable of calculating the target effect due to impact by a projectile. For personnel targets, ASPECT can predict the probability of incapacitation due to single or multiple impacts at various discrete regions of the body (Head, Thorax, Abdomen, etc. ), accounting not only for the properties of the impacting projectile but also for the nature of the injury required to prevent continued opposition of the target. If required, the effect of misses can also be considered by incorporation of the target suppression algorithms. Terminal effects for vehicle targets can also be determined within ASPECT. 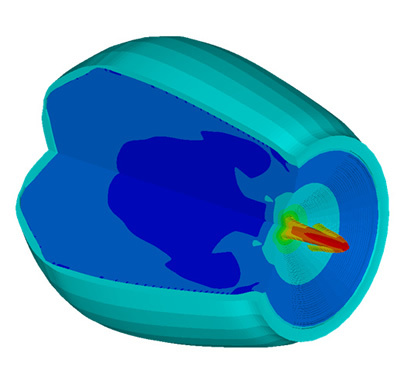 The software can model impact of the projectile with the vehicle hull and, based on theoretical or empirically derived algorithms, determine the resulting penetration depth and path. If perforation occurs, ASPECT performs penetration and damage assessments of any internal components or personnel. Interpretation of damage results allows the probability of mission, mobility, communications or firepower kills to be determined. The terminal effects capability within ASPECT is suitable for use with solid, kinetic energy projectiles and also chemical energy, fragmenting munitions against single or multiple target arrays. It has been used extensively to assess the terminal effectiveness of various natures of ammunition, to provide robust evidence against customer performance requirements. Results can provide both quantitative, numerical measures of performance (e.g. Lethal Radius, Probability of Incapacitation, etc.) and visual outputs in the form of lethality contour maps. ASPECT can determine the overall performance of weapon and protection systems in a wide range of realistic battlefield scenarios. Drawing on the software’s ability to determine probability of hit through detailed consideration of the error budget and level of target damage through terminal effects calculations, ASPECT can quickly perform Monte Carlo analyses of multiple engagements and scenarios to generate quantitative performance feedback for the system. A wide range of targets can be modelled across the land, sea and air domains, include personnel, ships, aircraft, vehicles, buildings and other structures. 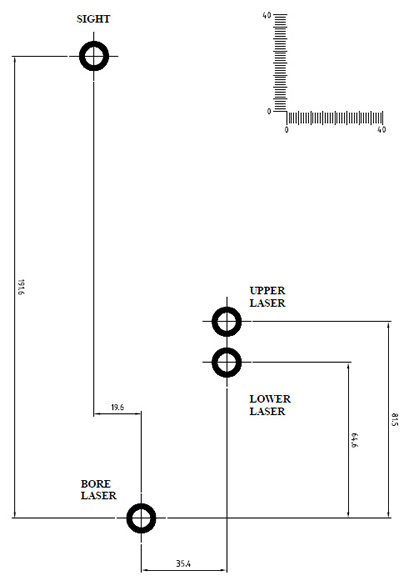 Targets can be static or moving, and postures/orientations and protection levels can be configured specifically to meet customer requirements. 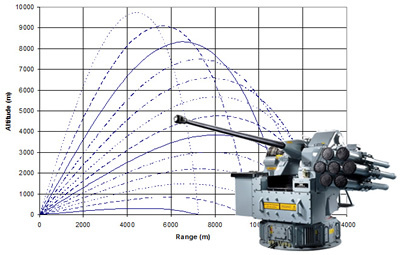 In addition, detailed configuration of the ammunition load and engagement timings (e.g. ammunition nature, rate of fire, time to change magazines, number of rounds, etc.) can be conducted to provide sensitivity analysis and ensure that results are credible, realistic and robust. Analysis of results can provide a range of performance and effectiveness metrics to be generated including time to achieve the required result, ammunition expended to achieve the required result, and duration of suppression achieved. Used at an early stage these quantitative outputs can be used to inform requirements generation processes, during development to optimise overall system performance, and to assist in verification against system capability requirements. SDE’s ASPECT system performance modelling capability has been used widely both within the UK and overseas to support research and development and procurement programmes due to its versatility and unique capability. Examples of analyses which have been conducted include Aircraft Self Damage assessments, Red on Blue engagement modelling, ammunition studies and personnel protection system studies.